NW English Pratikraman 2018 | Oshwal Association of the U.K.
“This is my first time doing Pratikraman and I thoroughly enjoyed it”. Just a few of the comments received from those who attended. Everyone has been energized and spiritually uplifted after our Paryushan festival. Oshwal NW have yet again positively placed the English Pratikraman for all 8 days firmly on the map in their area. Conducted by the wonderful and highly capable team from Shree Chandana Vidyapeeth Jain School (SCVP) the feedback as you can see above, has again been truly amazing. For Oshwal NW this additional Pratikraman each day allowed not only the young but the older generation a chance to learn about the essence of this wonderful dharma and ritual we take part in. Very innovative way of doing as well as learning by following each stage on a large projection and reciting both in English and the traditional language. Every stage was explained in English daily explanations of different parts. Some of the prayers including the vanditu sutra were wonderfully recited by children with full explanations projected on the screen. 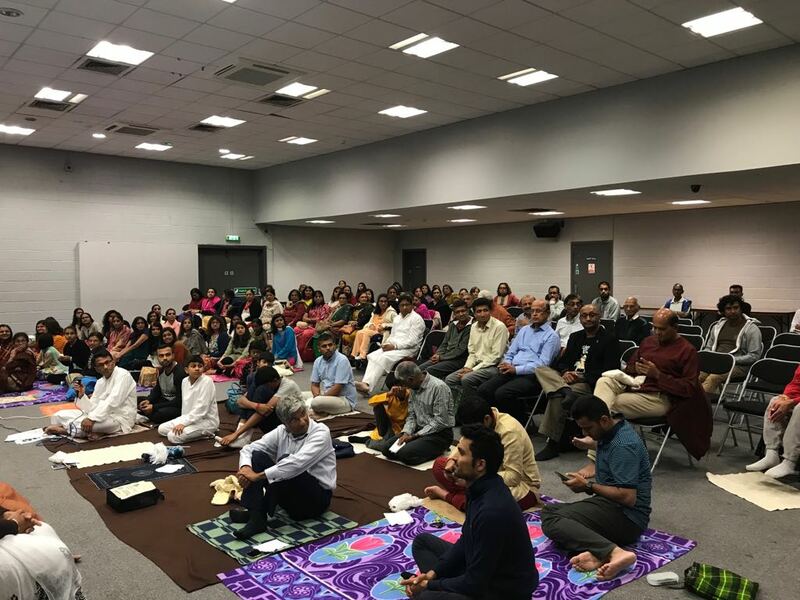 The English Pratikraman for all 8 days has now really taken off for Oshwal NW thanks to the SCVP team and is allowing so many more people to enjoy and take part without any formality except having the right bhaav. Average attendance each day was nearly 200 people with final day being nearly 300. Oshwal NW and SCVP have the vision of offering this event with a view to ensuring the next generation and beyond continue the ritual as did our forefathers but at the same time understanding the meaning. A very big thank you to SCVP for its sterling efforts again this year. Back to North West page.